Sometimes, my teams just don’t work as I intended. This was one of those weeks. The Team: Black Widow Haymaker. Not a bad start. Call out a Sidekick with Widow, use Haymaker on her, that’s 5 damage, minimum. Who/what else do I want on the team? Start with White Tiger, in case a clever opponent decides to be stingy about leaving Sidekicks around to be called out. Acererak, for the global, mostly in case the action die hating Scarlet Witch decides to come out of hiding. Speaking of Scarlet Witch, I decided to add the one from the Doctor Strange team pack which lets you prep your action dice after you use them. Now, if I can make Widow hit harder, I shouldn’t have to do it as often. Maybe I could try common Utility Belt, with Trusted Friend as my second BAC, allowing me to use the global to make Widow Bat-Family? I also thought if I was going to buy multiple action dice, the Thor with the global would be useful. With both BACs already in use, there was no room for Cone of Cold, so I included Sky Claw for its similar global. 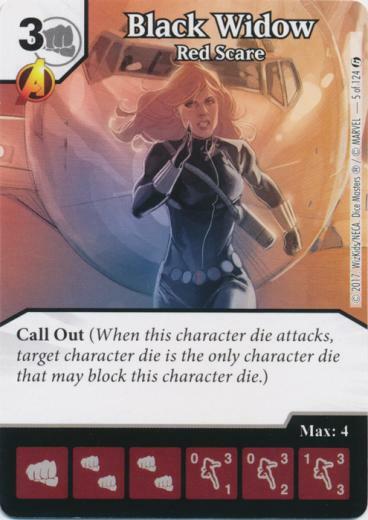 Last was Avenger ID Card: Making It Official as another potential way to buff Widow. How did it work? Not well. Rare Nightwing. Villainous Pact and Resurrection as BACs, providing some ramp. Oh, he had some other Bat-Family character cards (and dice) on his mat but they were basically there only as decorations. He’d attack with multiple Nightwings, wiping out my field from Nightwing’s ability, and walk through for damage. I couldn’t muster enough D to do anything about it. He was running the Atlas with the Fist Prep global, which exacerbated a problem with my build. My lowest cost characters (Black Widow, Sky Claw, and White Tiger) were all 3-cost, and they were all fists. And I never seemed to roll two fists (or ‘?’s) on the same turn the entire game. There were a number of turns where I would have liked to buy one of my fist characters and prep a die, but I never had the correct energy to do so. I compounded the issue by buying too many action dice early on, none of which had fist energy. I bought my Thor one turn, because I had 6 energy, none of which were fists. The rules confusion didn’t hurt my opponent, buy between some poor early rolls and my lack of foresight gumming up my bag with too many action dice, I don’t think this was a game I was going to win even if we had played Chaos Warp right. I won’t say I didn’t put any thought into this team, but I didn’t put enough thought. A 2-cost mask die. 3 3-cost fist characters and a 3-cost fist action die. A 4-cost bolt character and 2 6-cost bolt characters. So if I don’t get a fist (or ‘?’) my cheapest character is a 4-cost. That’s just asking for trouble. Also, I didn’t give any real consideration to including a force block, and I should have. 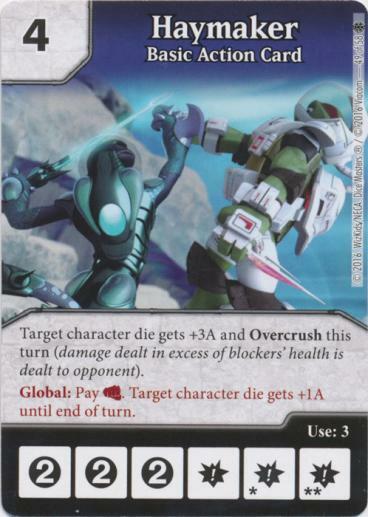 With Call Out, the opponent still has the option of not blocking. With Haymaker, that means Widow does 1 more damage, but it’s likely worth it to get her off the field. Conversely, she’s cheap enough buying multiple dice for her is feasible, and she probably won’t take that long to cycle anyhow. Anyhow, to wrap things up I still thing Red Scare and Haymaker can form the core of a decent team, but I need to think a lot harder about the supporting pieces that are needed to make that team work.